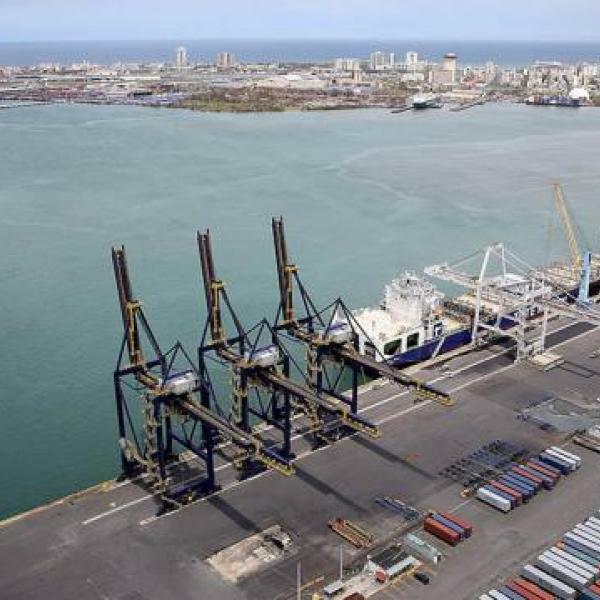 Port of San Juan is a major hub for the delivery of cargo and materials to the people of the Caribbean. The port is comprised of a total of sixteen piers, eight of which are used for passenger ships and eight for cargo ships. Founded in 1938, Luis A. Ayala Colón Sucrs., Inc. is today among the largest stevedoring contractors and shipping agencies in Puerto Rico and operates Piers A, B, C and G in the Puerto Nuevo Port Area. Ayala Colón has traditionally used 1000 watt high pressure sodium lights for illuminating the container yard which spans 60 acres across the facility. These outdated lights are expensive to operate with the high kWh utility rates in Puerto Rico and the port is having to re-lamp or repair these lights about once a year. Retrofit traditional 1000W HPS high mast lighting with Bright Light Systems NOVA HM LED High Mast fixtures with integrated BLS Wireless Controller. Using 10 fixtures per pole with IES Type V symmetrical distribution, fixture count is reduced while offering improved color recognition and better night-time visibility for port personnel. Each luminaire consumes just 570 watts and offers a 100,000 hour lifetime that generates significant energy and maintenance savings over the legacy HID luminaires. Use of the BLMS achieves an additional 25-30% in energy reduction for the customer.